Takano and Takai, who know Takei, are teaming up on the Takaucus, a project titled by Tonko. “I hope you’re not getting confused,” Rep. Mark Takai, D-Hawaii, said with a laugh. 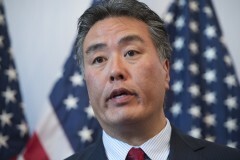 Takai and Rep. Mark Takano, D-Calif., share both Japanese-American heritage and similar names. The two Democrats are often mistaken for each other and have fun with the confusion. So, in an effort to raise money and hold an event with their friend, actor George Takei of "Star Trek" fame, they recently formed a joint fundraising committee and dubbed it the "Takaucus." When the actor offered to help the congressmen raise money for their respective campaigns, they decided the new committee, which allows them to raise funds collectively and to split the proceeds, was the "cleanest, most transparent way to pull it off," Takano said. A forthcoming Takaucus event, scheduled for Oct. 24 in New York, involves a dinner and preview of Takei’s new Broadway musical, "Allegiance ," which premieres a couple of weeks later. The first musical to tell the story of Japanese internment during World War II, it stars Takei and is based off his and his family’s experiences. It&apos;s particularly relevant to Takai, who highlighted the play in brief remarks on the House floor in February, and to Takano, whose relatives were interned during the war. "As much as we’d like to raise money for our campaigns, which is definitely a purpose, if we can help tell the Japanese-American story to more people, that’s a bonus," Takai said. Takano and Takai were quick to give credit for the Takaucus name to Rep. Paul Tonko, D-N.Y. Before Takai&apos;s election last year, Takano was often mixed up with Tonko, thanks to the similar phonetics of their last names. Their phone calls and luggage were misdirected to each other’s office. Seated next to each other in the Science, Space and Technology Committee, they continue to cause confusion during the roll call. With the swearing in of Takai in January, things got even more complicated. "I said [to Tonko], &apos;This is going to be interesting with a Takai, a Takano and a Tonko,” Takano said. Tonko quipped back, "Well, you know we can just form &apos;The Takaucus.&apos;"
The California congressman said he nearly fell over laughing. Thus, the choice in name for Takano and Takai&apos;s new committee was obvious — and is even more fitting given their intent to collaborate with Takei. Takei and Takano have been familiar with each other for years. The actor supported Takano, who represents a district just east of Los Angeles, during his unsuccessful congressional campaigns in the 1990s, and the two have been friends since. Takano won his seat in 2012 and was re-elected last year with 57 percent of the vote. The two members try to have fun with the confusion. They sometimes get together and have a laugh over the latest story. Takai recalled a recent incident at a conference where the organizers congratulated the Hawaii congressman on the good work he was doing for California. Last week on the House floor, a colleague realized halfway through their conversation that he was talking to Mark Takai, not Mark Takano. Takano uses it as a running joke. At this year&apos;s State of the Union, he was given a lei to wear by Takai. When a reporter from the Washington Post tweeted that night that Takano was "sporting a lei," Takano had his communications director tweet back that they must have mistaken him for Takai. He used the joke again at a recent book-signing party for New York Rep. Steve Israel, when Minority Whip Steny H. Hoyer, D-Md., announced the members in attendance. When Takano’s name was not mentioned because he was out of Hoyer&apos;s line of sight, Takano called out, "You forgot Mark Takai!" "Kudos to him for catching it," Takano said, "because that was a low thing that I pulled there." Besides the impetus for joining forces on fundraising, one positive aspect about the likelihood for confusion, according to Takai, is it means the Takaucus can be in many places at once. Takai said it looks like he&apos;s "everywhere." While numerous joint fundraising committees are formed around a single event, Takai expects this one to last beyond their scheduled fall fundraiser. "I think this is going to be a lasting relationship, friendship and a partnership," he said. "I’d like to continue working together with George, and I’m going to definitely work together with Mark Takano for as long as I’m here." Scalise, McHenry Go Forward, Move Ahead With Whip It Good PAC Costly Midterms Fuel Hundreds of Joint Fundraising Committees Roll Call Race Ratings Map: Ratings for Every House and Senate Race in 2016 Get breaking news alerts and more from Roll Call in your inbox or on your iPhone.